cutting slices of a certain weight. an official lumberjack discipline. one of the goals of the development was to integrate complex technologies like mixed reality, computer vision and haptic simulation into a well-known interface to enable an ad-hoc intuitive experience for the user without training. the center of the simulation is a modified chainsaw serving as an interaction device. motor and carburetor have been removed and replaced by electronics. there are leds at the guide bar for tracking. 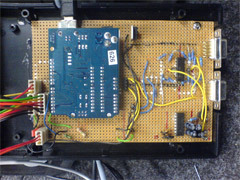 sensors have been integrated for the measurement of throttle and starter. vibration motors are providing a realistic haptic simulation of the motor’s vibration. 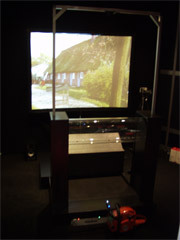 the visualization consists of a projection showing a photorealistic view of a northern german farm with tractors, animals and plants. in the foreground of the scene there is a common sawhorse with a log of pinewood on it. in front of the projection screen there is an abstract mockup of a sawhorse with an acrylic tube instead of a wooden log on it. 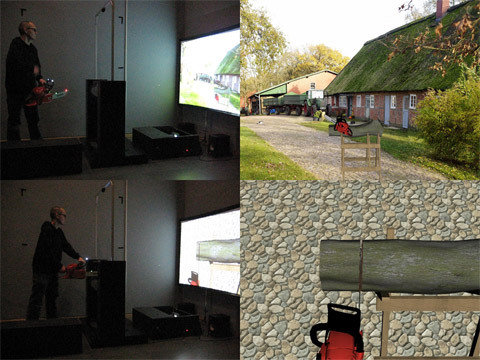 together with the modified chainsaw these two objects represent the haptic simulation during the sawing. the acrylic tube goes down as soon as the guide bar of the running chainsaw applies pressure on it and thus simulates the resistance while sawing a log. over the sawhorse a camera recognizes the leds on the chainsaw’s guide bar for the tracking of its position. at the beginning the user sees and hears the farm scene. a tractor parks in the yard, cats are sitting in front of the door, in the background cows are lowing and birds are singing. 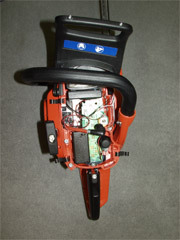 the user raises the real chainsaw and starts it by pulling the starter. the silence is beeing replaced by the loud noise of the engine. the motor howls when the throttle is pulled. the camera zooms on the sawhorse and a 3d model of the chainsaw moves over it analog to the real chainsaw’s movements in the user’s hands. as soon as the guide bar applies pressure on the tube and the chainsaw accelerates one sees how it saws into the virtual log and chips are flying around. after cutting through the log the resulting slize and its weight is presented on the projection screen.